Sarah Eva Howe's scrapbooks include many items that I call "bits and pieces" – a photo here; a letter there; a brief written description of an event, a favorite book, or a thought. These items can be wonderful glimpses into Sarah's life and the history of her family and her time, but they could hardly fill a blog post on their own. Today's post launches a recurring feature called Bits & Pieces – collections of those snippets of history. Sarah Eva Howe pasted into a scrapbook three small photographic images, one of herself and two others of young women she did not identify. She called these tiny portraits "penny pictures." According to " Lens," a photography blog by the New York Times, portrait photographers of the time (and later) used a special camera to take these 1.5-inch-square images that were inexpensive for the photographer to produce and for the buyer to buy. I think Sarah is about 15 years old in this image, which would date it 1898. It's fun to imagine that she and her friends went to a local photographer – or maybe an itinerant photographer with a temporary studio at Howe Brothers department store – to have these small keepsakes made. I remember going into photo booths at the fair or at the local five-and-dime. The images I took home or swapped with friends may be equivalent to those 19th-century penny pictures. At the age of 12, Sarah discovered that a bookstore in her home town of Carrollton, Kentucky, not only sold books but let patrons borrow from a small lending library in the back of the store. I can just imagine how much this little library meant to Sarah. I doubt her family, although prosperous in business, could have bought all the books this insatiable reader wanted to read. 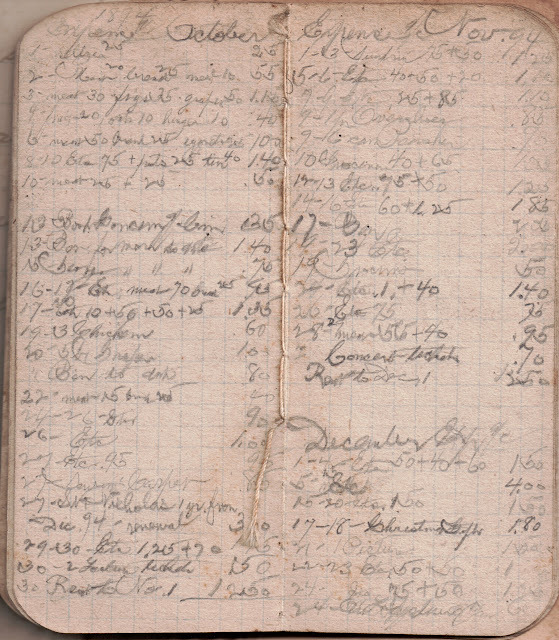 About 1895 I discovered Mrs. Atha Gullim's library at the book store. You could take out a book and keep it two weeks. I read my first Dickens that year, but they were in a large book of four novels. My first, I think, was Nicholas Nickleby. ... I was younger than I was in '96 when I read the lively books of Frances Hodgson Burnett lent to me by Mrs. Henry Winslow. ... In 1995-96 school year Albert Whitehead sat in front of me. ... I had to help him a lot, especially with arithmetic. I think Mamie Merrill sat back of me most of the year. We didn't have seatmates that year. . . . It was around this time [1897, the year Sarah attended Aunt Lee's wedding in Cincinnati] that we began to hear about “wireless telegraphy” but of course had no idea of its importance. A song of a little later vintage said “Now wire-less telegraphy is cutting quite a dash and messages across the sea are sent just like a flash and young Marconi eats macaroni with Mr. Dooley ooly ooly ooly oo!" The car in the scene tells us this drawing was produced much later than 1897. When Sarah saw it in a newspaper or magazine, it reminded her of hearing news about this new invention. I'm surprised at her comment about not realizing the importance of wireless telegraphy. After all, this was the little girl who the year before had predicted package delivery by drones! Sarah filled four scrapbook pages with details about school work done and books read in 1896-1897, concluding with her memories of a crush she had on Will Roland, a son of the pastor of the church she and her family attended, Carrollton Methodist Episcopal. Sarah celebrated her 13th birthday at the beginning of that school year.
. . . The copy of Tennyson that held all this beauty for me was the little green one Mrs. Rowland . . . gave to Papa one Christmas. Perhaps it was the influence of the thoughts that prompted Giftee and Giver that turned my thoughts a little later on to Mrs. Rowland's son – not Vachel, who in common with most of the girls I had for a year or more had as "beau ideal" and romantic interest with however no thought of personal possession – but Will, the older boy, who as it happened in my freshman year sat across the aisle from me where I soon came to watch breathlessly as he wrote his exercises in his faultless small penmanship. He was shy, pale, studious, very smart, and to me utterly charming and desirable. Yet I never so much as even addressed him "on my own," and when on one occasion he wrote a little note about something on the board and held it up for me to see, and smiled his rare smile, I was so suffocated with the emotion incidental to it, I just nodded my head and said nothing. Sarah saved many "50 Years Ago in the Journal" clippings from the nationally distributed magazine Ladies' Home Journal. From those clippings, here are a few news briefs and tips looking back to 1897. I've linked some of the items to websites that provide more information. In October, the terrible yellow-fever epidemic spread from New Orleans to Texas. An opera house dome fell on a Cincinnati audience. The Klondike reported 6 suicides among gold miners, 22 killings, and several deaths from exposure. A son was born to the Grover Clevelands. Famous journalist Charles A. Dana died. Verdi, still writing some of his best music, celebrated his eighty-fourth birthday. To feed a family of 8 on $10 a week: "Purchase a loin of beef weighing 18 to 20 pounds. Cut it up for filet mignon on Sunday, steak on Monday, roast beef on Tuesday, stew on Wednesday, and hamburg on Thursday." In 1895-96 or so, when the Carrollton, Kentucky, school board voted to do away with the high school grades, a number of dissatisfied families removed their children from the public school in favor of a Carrollton Seminary, also known as "Mr. English's school." 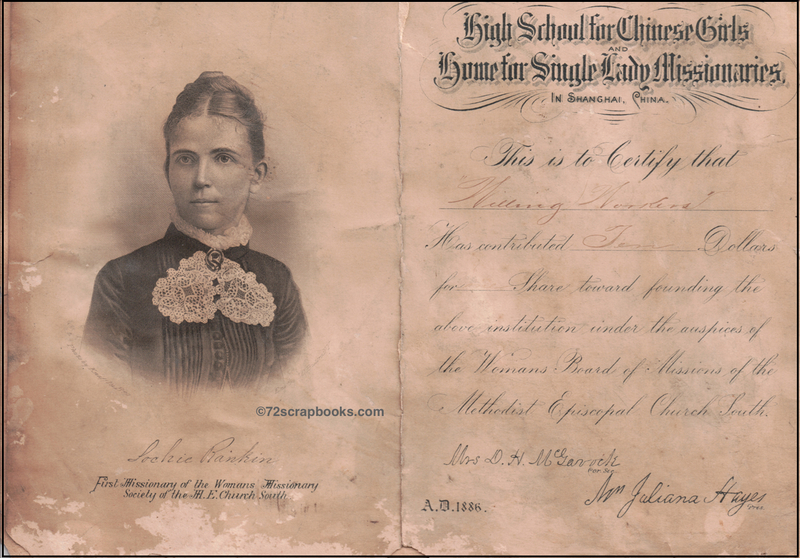 The Howe family and a number of related families – plus several that would become related to them through later marriages – were strong supporters of the private school, and Sarah wrote in the scrapbooks about the education she received there. 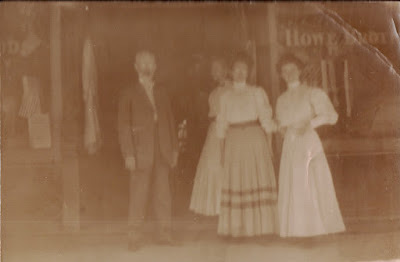 In one of the scrapbooks is this faded photo, marked as taken in the fall of 1896. Writing much later, possibly 1925-1935, Sarah named as many of the students as she could recall. I posted a transcription of this list in an earlier post, but I had not found the photo then. Here's the list again. In transcribing it, I've offered alternatives or question marks when the writing isn't clear. I welcome corrections. 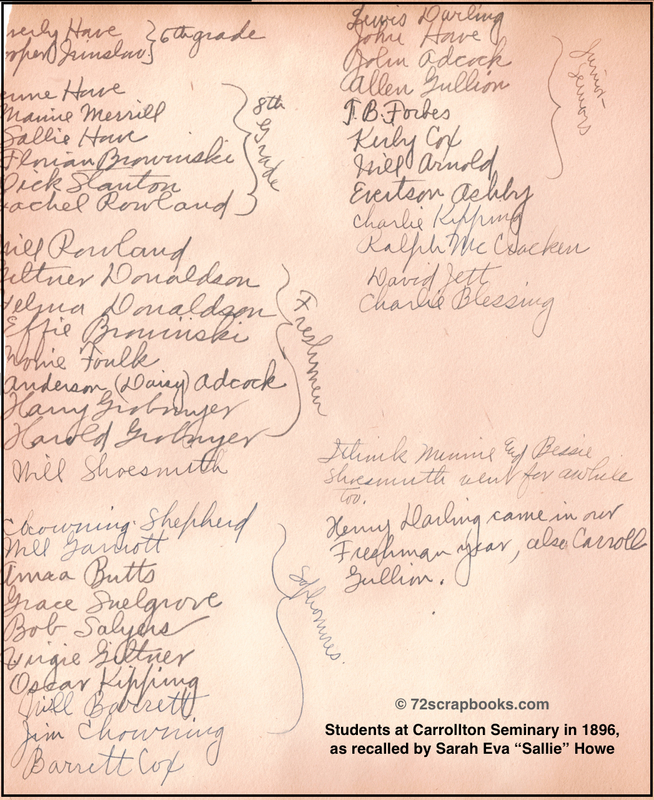 Sarah's Notes: I think Minnie and Bessie Shoesmith went for awhile, too. Kenny (Henry?) Darling came in our Freshman year, also Carroll Gullion. Sarah lists 39 names, and I see 37 faces. 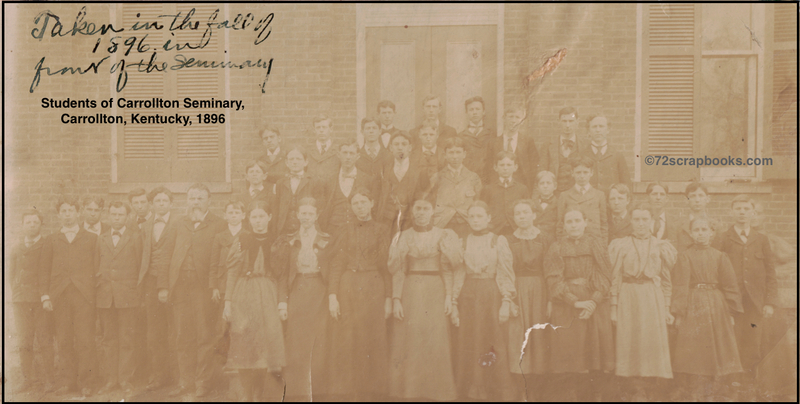 I'm assuming the bearded man in the front is none other than John T. English, the head of the school, and maybe there is another teacher or two in the group. One is likely to be Sarah's cousin Lille Howe, who was recruited to teach there when she was 19. If only Sarah had said which face went with each name. There's a lesson for all of us: With group photos, name each person by the position in which he/she appears in the image -- but, of course, do not write on the original photo! Make a photocopy of the photo, write the names on the copy, and attach the copy to the back of the photo using archival tape or adhesive. Another approach: Attach the original photo with archival tape or adhesive to a larger sheet of acid-free paper and use acid-free ink to write identifications (or attach the marked-up photocopy) below the image. Sarah's scrapbooks are teaching me a lot about how to preserve photos, clippings, and letters for future generations to discover. I grew up in Louisville, Kentucky, in the 1940s and 1950s. On days when my two younger sisters and I wore our mother's patience thin, she would throw up her hands and proclaim, "I might as well check in at Lakeland." We were too young to know what Lakeland was, but Mama's tone of voice told us it must be a place for people who had just about reached their breaking point. 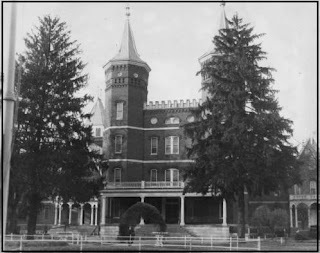 Decades later, I figured out that Mama was referring to Lakeland Asylum for the Insane (as it was once known), a mental health facility in Anchorage, just east of Louisville. Other names for the facility were Central Kentucky Lunatic Asylum, Lakeland Hospital, and Central Kentucky Asylum for the Insane. You may know it by its present name, Central State Hospital. In 1898, Sarah Eva Howe and her cousin Jenne, both about 15 years of age, traveled from Carrollton, Kentucky, to Anchorage to visit Mildred Goslee, whose father was the Lakeland superintendent. Sarah's comments give us a peek at some of the social customs of the day and include references to some of the charity and mission projects that involved her mother, cousins, aunts, and friends in Carrollton, Kentucky. As soon as school closed, Jenne and I began to get ready for our big trip, which was to be a visit to Mildred Goslee at Anchorage, or rather Lakeland, for tho she went to school at Bellewood1and we were to attend her closing exercises, she lived with her family in the Superintendents home at the Asylum. We ate at their table, with the other doctors and their wives, and the food was really delicious; we went all over the buildings “on tours,” especially into the kitchens, where I saw more beans being prepared to cook than ever in my life so far. On Saturday night we looked on at the dance given every week for the patients and attendants. 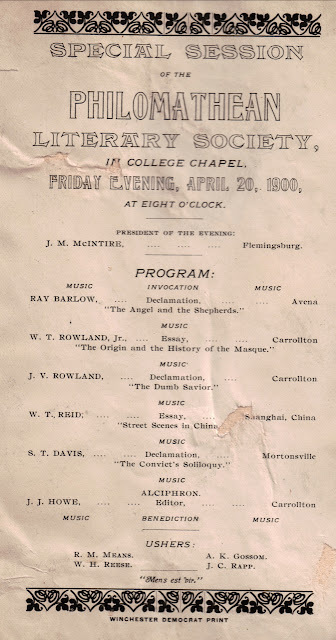 We attended class night, when Mildred sang and several girls contested for a prize in “elocution.” The girl who won had a long recitation about a gypsy, which ended “like Wild Zaratella, whose lover is dead.” Sunday we attended church at the present Anchorage Presbyterian Church. At the close of the service Mildred introduced us to several of her friends; one well dressed lady rushed up to us and said “Have you ever heard of Ramabai?” We were dazed, we never had, and didn’t know whether it was a medicine or a new kind of flower or food. 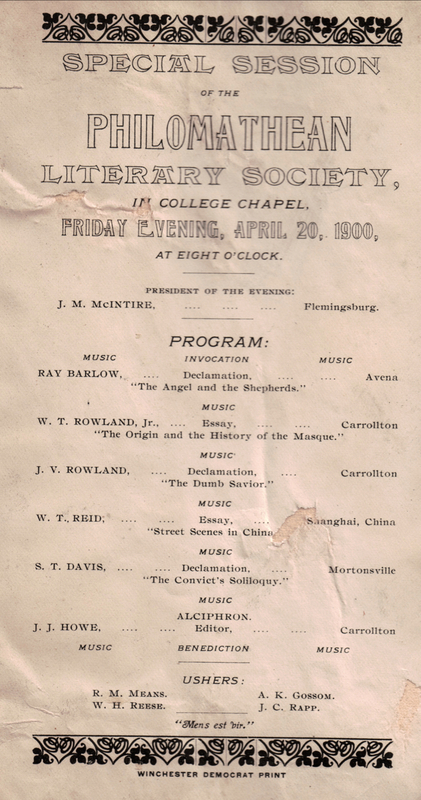 The Willing Workers Missionary Society of Carrollton (Kentucky) Methodist Episcopal Church received this certificate circa 1886 recognizing a $10 donation to a project in China. Sarah's mother Alice Ada Cost Howe was a member of that society, and Sarah later joined. societies, the Foreign Mission and “home mission” or “Parsonage” societies – but we had no missionaries in India in the southern Methodist church so knew nothing of the work done there. The graduation exercises were held, I believe, Tuesday morning – this was the week of June 9, for on that day we went to the exercises at "Rest Cottage" named for the Frances E. Willard one in Chicago where poor working girls could go for a week of free vacation in the summer and have instruction and entertainment as well as food and lodging. 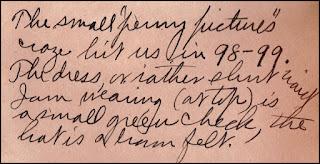 Jennie Casseday was really the originator of the idea, and every WCTU3 had (and has yet) a department in her honor called The Flower Mission in which special attention is given to sending, as she did (and she was for so many years acclaimed), little bunches of flowers to the sick at hospitals with verses of cheer and comfort attached. Her birthday, June 9th is always especially celebrated by a particular act of mercy – in Carrollton we took a treat and held a service on that day at the Poor Farm. So, as I say, in 1898 on that day we went to exercises at Rest Cottage. On Tuesday there was the Bellewood Graduation. I don’t remember much about it, except that there was an Anne Finzer who graduated (of the Nicholas Finzer Company, tobacco people). She had the most exquisite white dress of lace and sheer “voile” and carried a sheaf of lilies (and this was why I particularly remembered her) in her withered left arm pressed against her body; she probably had had infantile paralysis4, tho we knew nothing of it then – even her wealth had not been able to help that poor little arm. On another page in the same scrapbook, Sarah provides a bit more history of Bellewood Seminary. The excerpt refers again to Mildred Goslee. Transcription: [Mildred Goslee was] now living at Lakeland Hospital, where her father was superintendent (appointed by Governor Bradley) and was for the second year attending Bellewood Seminary, a famous local Presbyterian School (its buildings now are incorporated in the Orphanage at Anchorage and the chapel is the Anchorage Pres. Church. This is the school mentioned in The Little Colonel at Boarding School written sometime later. 1 Bellewood Female Seminary, established in 1860 by William Wallace Hill. The school was associated with the Anchorage Presbyterian Church until the school closed in 1916. Source: The Encyclopedia of Louisville by John E. Kieber, page 33, via Google Books. 2 Image ULPA 1994.18.0716, Herald Post Collection, 1994.18, Photographic Archives, University of Louisville, Louisville, Kentucky. Used here with permission. 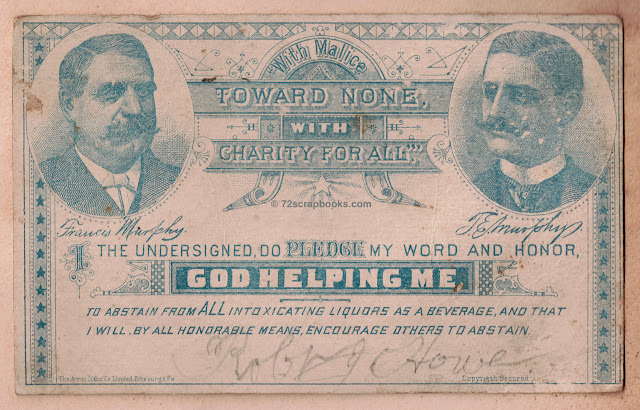 3 Women's Christian Temperance Union. Sarah's mother, and later Sarah, were members. 4 An old term for polio, an infectious disease (now all but eradicated in the U.S.) that can cause paralysis, difficulty breathing, and sometimes death. Source: www.mayoclinic.org. In Carrollton, Kentucky, at the close of the Spanish-American War, Sarah Eva Howe and her relatives and friends were busier than ever with school, work, and other elements of everyday life. Sarah's stories of 1899 start to include a new element: romance. Sarah was 16. No surprise, then, that she and her cousins and schoolmates were talking about the local boys. Today's excerpts mention some of the budding and wished-for romances. Apparently, Sarah once had a crush on a young man named Will Rowland. Her friend and "shirttail cousin" Mildred Goslee also was smitten with Will. Both girls were disappointed when Will proposed to a young woman who lived "in the East." Sarah points out that Will Salyers had "transferred his affections" from one girl in favor of dating others. Will, you may remember from earlier posts, would become Sarah's husband six years later. Endnotes after the transcription may help you sort out some of the Howe relatives mentioned in Sarah's thoughts. Long passages full of names can be tedious to read, but I dare not leave anyone out. If I delete even one, I may be hiding "genealogy gold" from someone searching for that very name! 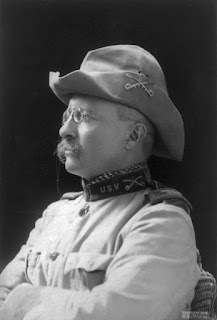 1899 found us, as a nation, over the Spanish War, but still fighting with Aguinaldo in the Philippines. It found Jenne1 and myself trying to make up the time lost until some other school could be found for us2 by reading all we could lay our hands on. John3 was in this second year at Wesleyan4, Lille5 was still working as cashier at the store, and Beverly6 started in as “apprentice boy” til he too could be put in school. There were rumors that the regular High School was to be started again in the fall, at Carrollton High School. Grandma Cost7 and her family were living in the big house on Ellison Ave [in Cincinnati]. Mr. Salyers8 had begun building a new house in a lot taken from the old one and was selling the other house to the Blackwell family (Mrs. B. was Edna Corbin). Will9 had transferred his affections from Stella Stucey (tho they almost decided to marry at one time) to various pretty girls, none very serious, especially visitors; he still made some trips to Madison again and hired many “rigs” to take them riding from Grobmeyer Bros. Harry and Harold Grobmeyer had been sent to a Catholic seminary at Jasper, Indiana, where they later graduated. At the church Brother Rowland had been made our pastor, to our great satisfaction because we were so fond of the family, tho many of the members did not enjoy his preaching. He was a very quiet, stern-appearing man, tho kind and fun-loving at home, and Mrs. Rowland was the loveliest person imaginable. They had a most wonderful home life, especially making a great deal of Christmas, with a “breakfast” at 9:30 that made the day the most memorable in the year, all the relatives and close friends were invited (in the family connection). 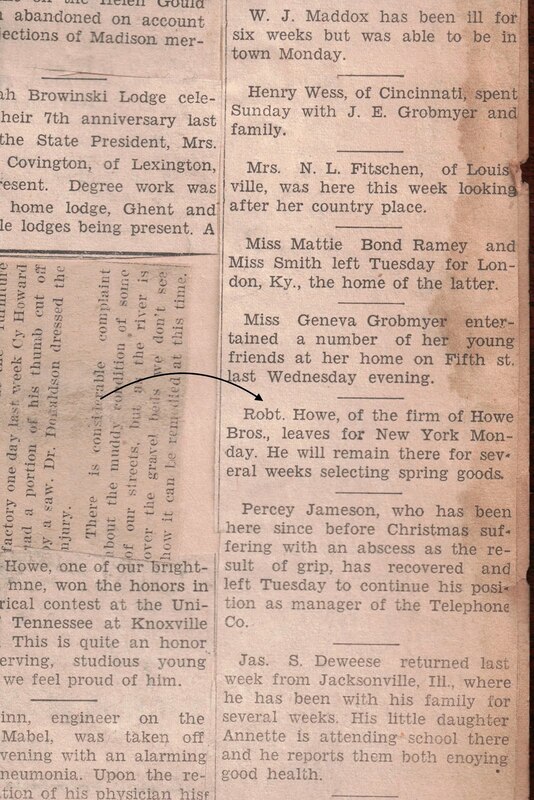 In that day Mildred Goslee (after they came back to live in Carrollton when Dr. Goslee died, which was either in 1899 or 1900) was invited with Effie Browinski, whose mother was a sister of Mrs. Rowland; so she gradually became an extremely good friend of Will Rowland (and thus took what I never really had!). I think she was very fond indeed of him – and he of her. ... I remember being at a party with her the day his marriage was announced in the East and by her really forced gaiety, one could see she was thinking of their past association. especially in oratory, English, and languages. 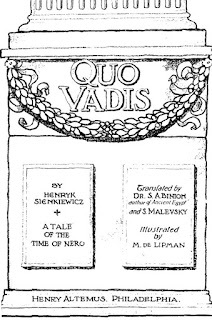 At one time he boarded with the Batsons (I afterwards knew Mrs. Batson at Lexington), and I was endlessly diverted with the stories Jenne could relate to me of his college experiences, the songs he learned, the boys he met, his choice between the two rival literary societies (there were no fraternities there), finally becoming a “Philomathean” (the other was the Eucleian). Sarah's mother's illness sounds both serious and mysterious! I have found nothing yet in the scrapbooks about a diagnosis or other details, but fear not. Sarah's mother Alice Ada Cost Howe lived for 30 years after this illness. At the start of the final paragraph, we learn that Sarah did not return to high school when the high school grades were re-established at the Carrollton public school. Even so, she was a life-long learner, voracious reader, and one of the most educated people around. 1 Jenne Howe, Sarah's first cousin; daughter of her father's brother William Ficklin Howe. 3 John J. Howe, Sarah's first cousin; brother to Jenne. 4 Lille M. Howe, Sarah's first cousin; sister to Jenne and John. 5. 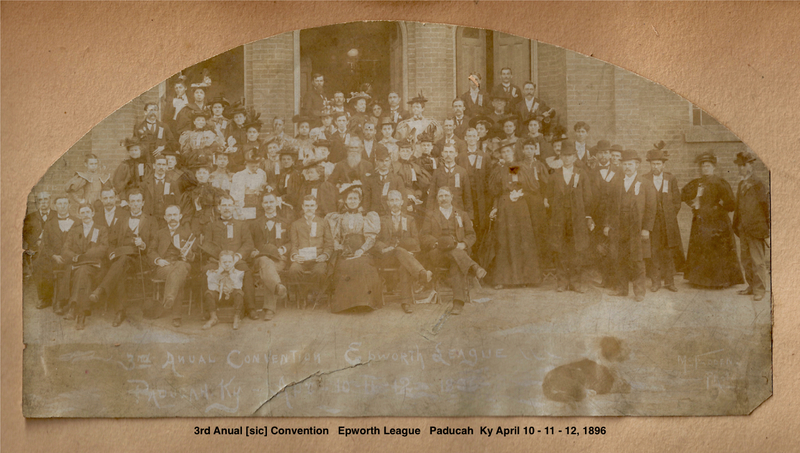 Kentucky Wesleyan College, a Methodist-supported institution that at that time was in Winchester, Kentucky. 7 Sarah Evaline Arnet Cost, Sarah's maternal grandmother; resident of Price Hill in Cincinnati. 8 Charles D. Salyers, Sarah's future father-in-law. 9 William Levi Salyers, son of Charles D. Salyers; Sarah's future husband. 10 Joseph Brown Howe, his wife Sallie Goslee Howe, and son George Howe. 11 James Howe, son of James Brown Howe and Sallie Goslee Howe; brother of George Howe. 12 Leonora Alice Howe, Sarah's sister. On April 25, 1898, when Sarah Eva Howe was 14, her nation declared war on Spain. The U.S. went to war to halt Spain's empire-building in the western hemisphere – my basic understanding of a complex world situation. Sarah, being Sarah, read about the Spanish-American War in the local newspaper and in magazines. She heard conversations about it at school and at her family's dinner table. Still, from her perspective, the war seemed to have little effect on her family and friends in Carrollton, Kentucky. 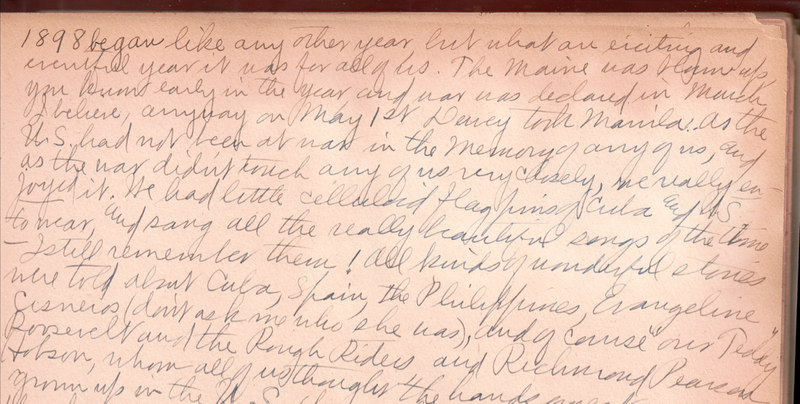 Sometime after 1915, Sarah wrote in a scrapbook her recollections of that year. She wrote to her four children, passing the family history on to them. Her recall of specific dates may be a little off, but she captures the mood of the time – at least the mood in her own world. all of us thought the handsomest man ever grown up in the U.S. (He sank the Merrimac across the channel in Havana Harbor, to keep the ships from getting out.) We wore ribbons, a foot long some of them, and when Patticus my cat presented us with just one live (and one dead) kitten, we named the dead one “Spain” and the live one “Cuba Libre”! (as we pronounced this Li-ber; even the most educated did so). Aunt Liza, who was now our “help” as Maggie had gone to work in a factory for a while, thought it was “Cuba Robber” and always called the kitten that way.) Poor “Cube,” as we sometimes called him! He was a cheerful cat but deformed, for he dragged his hind feet from birth, typical perhaps of Cuba’s early struggles for independence. Unlike Cuba tho, he succumbed to circumstances beyond his control when he was about 10 months old. As for our family, Lille6 was working in the store.7 Jenne8 and I finishing that memorable year with Prof. English, Leonora9 talking and walking. Brother Turner baptized her on Children’s Day, it was such a beautiful service – the church was decorated as usual with plants and cut flowers and this time canaries were hung in several places among the plants and made a lovely effect. 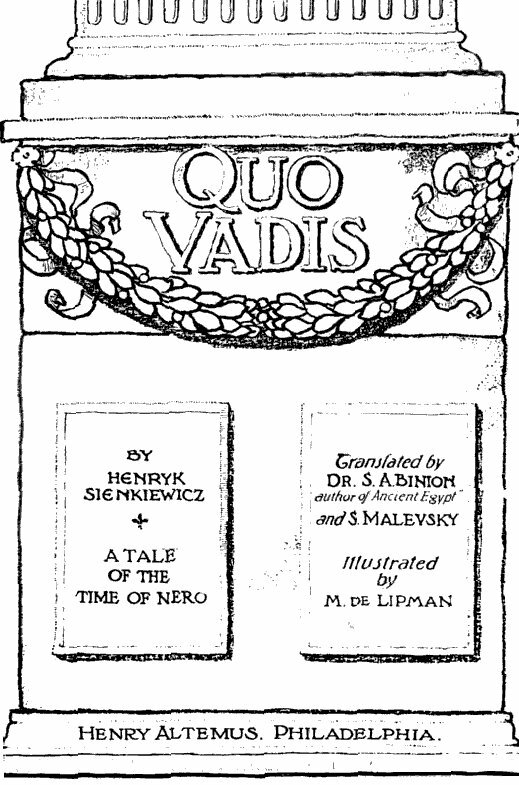 We were reading Quo Vadis that year, and many straitlaced people were insisting that the descriptions of the Roman feasts were not fit for respectable young females to peruse. I remember Brother Turner was asked about it, and he guardedly said it was rather extreme in some places for a so-called religious book. Brother Turner was a delightful young man, all of us girls liked him so much. 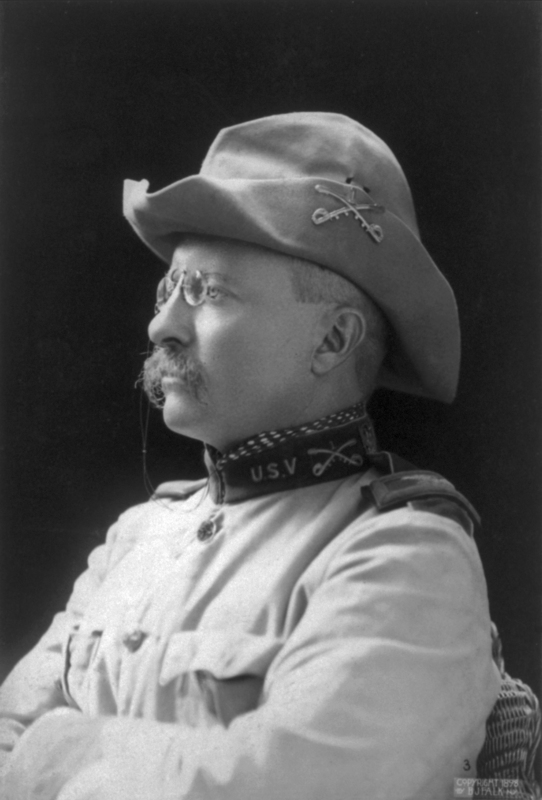 While I liked reading Sarah's memories of the Spanish-American War era, I wish she had included some of the items she mentioned: the celluloid flag pins, the ribbons. Sarah mentioned singing "all the really beautiful songs of the times." In the scrapbook, she wrote the titles of those songs. I was confused by the references to "blue and gray," typical of the Civil War. Sarah cleared up my confusion in a note at the bottom of the page: "U.S. uniforms during the Cuban War were all blue except the Rough Riders'." The opposition, apparently, wore gray. 1 The cartoon, "And Boys, Remember the Maine!" by Clifford Berryman, appeared in the Washington Post on April 3, 1898. (National Archives; public domain.) 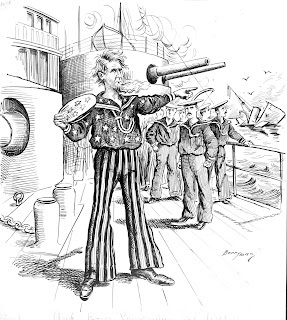 It shows an angry Uncle Sam addressing sailors as the USS Maine sinks in the background. 5 The writing is hard to read. Could the name be Jennson? Jamison? Carrollton of Sarah Eva Howe's childhood was a busy place. It had not one but two rivers to carry people and goods to and from the town. The importance of the rivers is clear in the first name of the settlement there: Port William. In her early scrapbooks, Sarah mentioned the rivers and her family's appreciation of them – and their dependence on them. 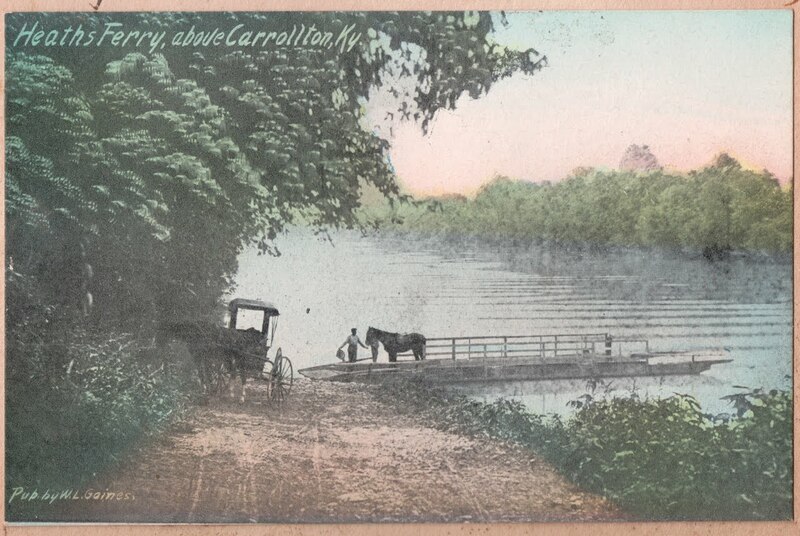 Today, we travel back in time to see some of the boats that were familiar to the people of Carrollton in the late 19th and early 20th centuries. All of these images come from the scrapbooks and are captioned with details from other sources. 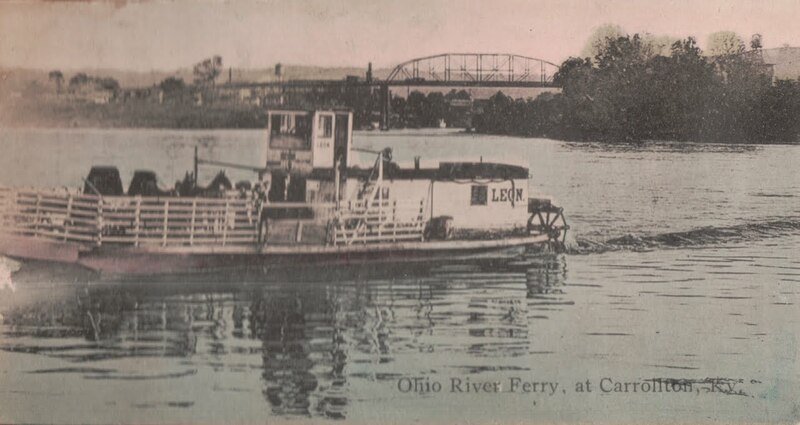 The Ferry Leon was built in 1895 and named by Captain J.B. Ashe for his only son. It was destroyed by ice when the Ohio River froze in 1918. Heath's Ferry carried crops to market. This image is undated. 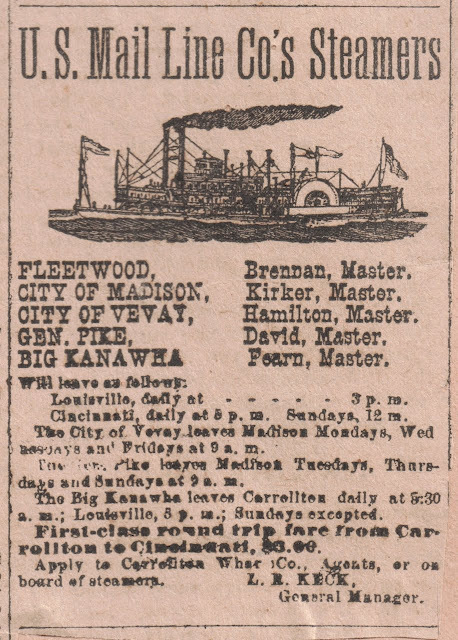 Although I included this newspaper ad in a previous post, I add it here because of the importance of the rivers to the distribution of mail and goods. 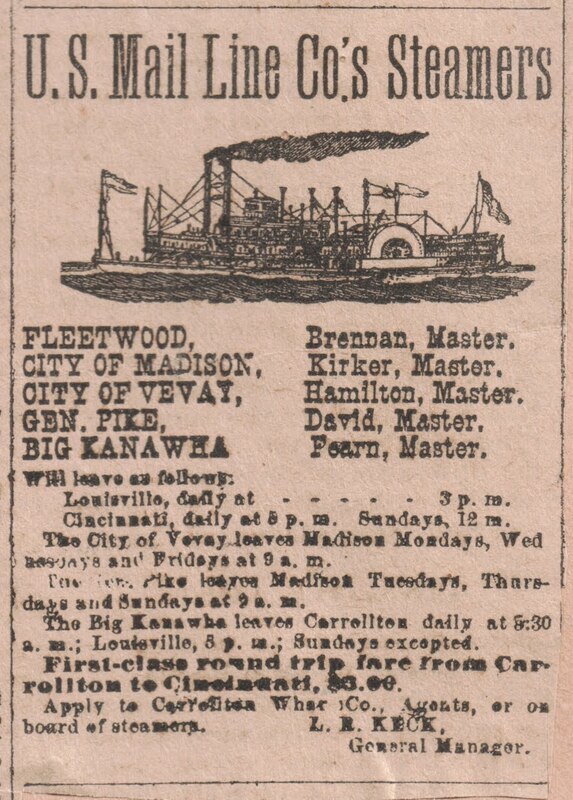 Boats like the one in the ad carried people as well as mail to nearby cities such as Cincinnati and Louisville. Coming through Lock #1, Carrollton, Ky. 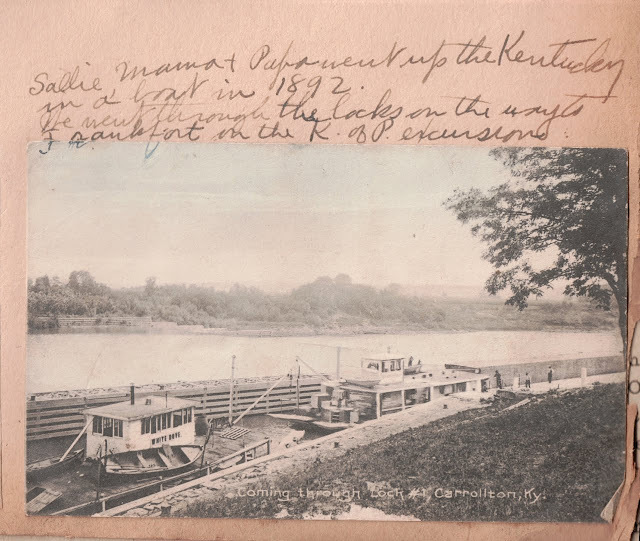 The handwriting about a trip up the Kentucky River to Frankfort looks like Sarah's, so her reference to "Sallie" may refer to her father's sister, Sarah Varena "Sallie" Howe Froman (1862-1950). It could also be Sallie Goslee Howe, wife of Sarah's Uncle Joseph Brown Howe. (Or could Sarah, a.k.a. Sallie, have referred to herself in first person?) "K. of P." is a reference to Knights of Pythias, an international fraternal and benevolent organization. The K. of P. chapter in Carrollton was known as Olive Lodge. People wanting to travel farther than a ferry could take them boarded larger steamboats. For photos and information about the steamers that stopped in Carrollton, visit http://www.nkyviews.com/carroll/carroll_steamers.htm. 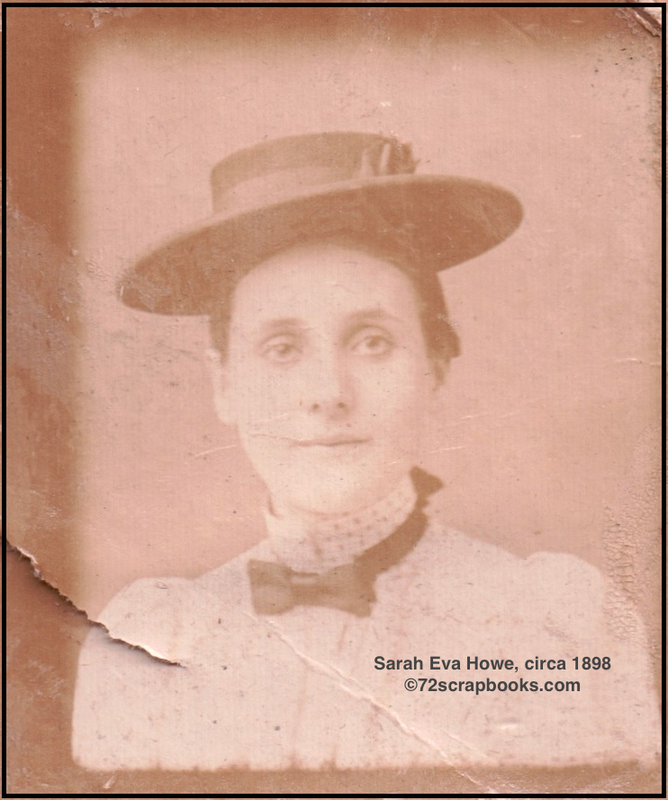 Sarah Eva Howe was a daddy's girl. That's my sense, based on what I see in her early scrapbooks. There are many loving mentions of her mother, Alice Ada Cost, but many more mentions of her father, Robert James Howe, and much more detail about the things he did and the ideas he expressed. Today, we get better acquainted with "Papa" – or Rob, as he was known to his friends. 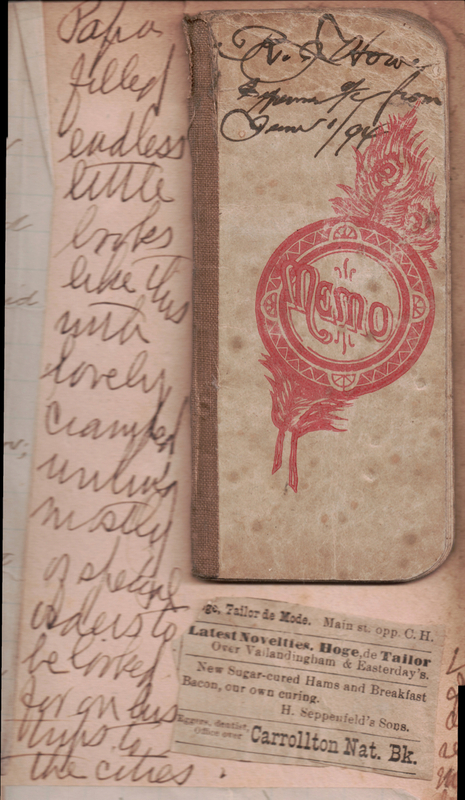 "Papa filled endless little books like this with lovely cramped writing mostly of special orders to be looked for on his trips to the cities." These and other entries in the list reveal or confirm things about Robert. His purchase of lecture and concert tickets indicate that he enjoyed culture and the arts and was a life-long learner. His renewal of his daughter's favorite magazine tells us that he encouraged Sarah to read. His habit of keeping these bits of information in such a detailed and consistent way makes me think he was a highly organized and meticulous man. Those characteristics fit with what we have already learned about his approach to business. Robert's contribution to Book Concern, the first publishing house of the Methodist Episcopal Church South, hints at his connection to that denomination. The scrapbooks confirm that he followed in his parents' footsteps as an active member and leader of Carrollton Methodist Episcopal Church (now Carrollton First United Methodist). Robert was also a leader in church programs on a state and regional level. In the next photo, he sits front and center (to viewer's right of the woman wearing leg-of-mutton sleeves) at a convention of the Epworth League, an association established in 1889 for young adults in the Methodist Episcopal Church. Robert would have been 41 that year, so he and others at the convention were likely the organizers within the organization. His place in the photo tells me he may have had a leadership role. 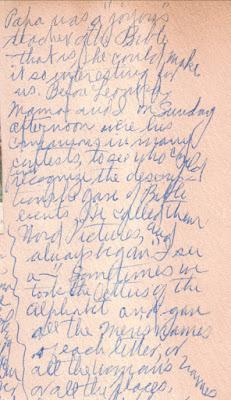 In her scrapbooks, Sarah pasted many items about her father's involvement with his church – too many to include in one post. She also wrote about his popularity as a Sunday school teacher and his commitment to Bible study at home. A portion of Sarah's writing about Bible lessons. "Papa was a joyous teacher of the Bible — that is, he could make it so interesting for us. Before Leonora, Mama and I on Sunday afternoon were his companions in many contests, to see who could first recognize the descriptions he gave of Bible events. He called them Word Pictures and always began 'I see a ____.' Sometimes we took the letters of the alphabet and gave all the men’s names of each letter, or all the women’s names or all the places. I remember how Papa astounded us all by finding the only one for F (it must have been in the Old Testament 'Fair Haven,' in Acts, about one of Paul’s journeys). Of course, there were Felix and Festus for men’s names." Considering Robert's strong faith and his leadership in the church, we can't be surprised to find his temperance card in the scrapbooks. Lest I paint him as always serious, I include an image of Sarah's Papa at a summer camp in Chicago. 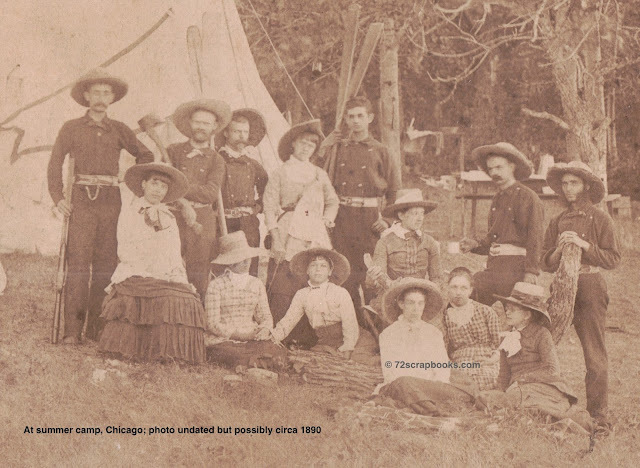 Robert (the man with the fishing pole in the picture with friend Harry Given and standing on the far left in the group picture) is not smiling, but I think this camp must have been for fun. The scrapbooks do not indicate what kind of camp this was; maybe it had something to do with the Methodist church or a literary or social organization. The scrapbook has similar photos of other people at the same event. Based on letters and postcards from Robert, and Sarah's written comments about her Papa, I know that the meticulous businessman also had a soft side. He cared deeply about his family – especially Sarah, if I dare speculate on that. He doted on her and encouraged her, and maybe, to some degree, spoiled her. He was her champion in education, and he taught her about the world. He included her in conversations about the news of the day. Robert obviously loved his wife. 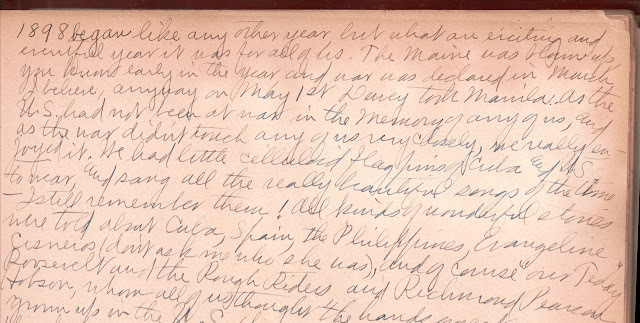 When he traveled, he wrote her almost every day – and some days twice. 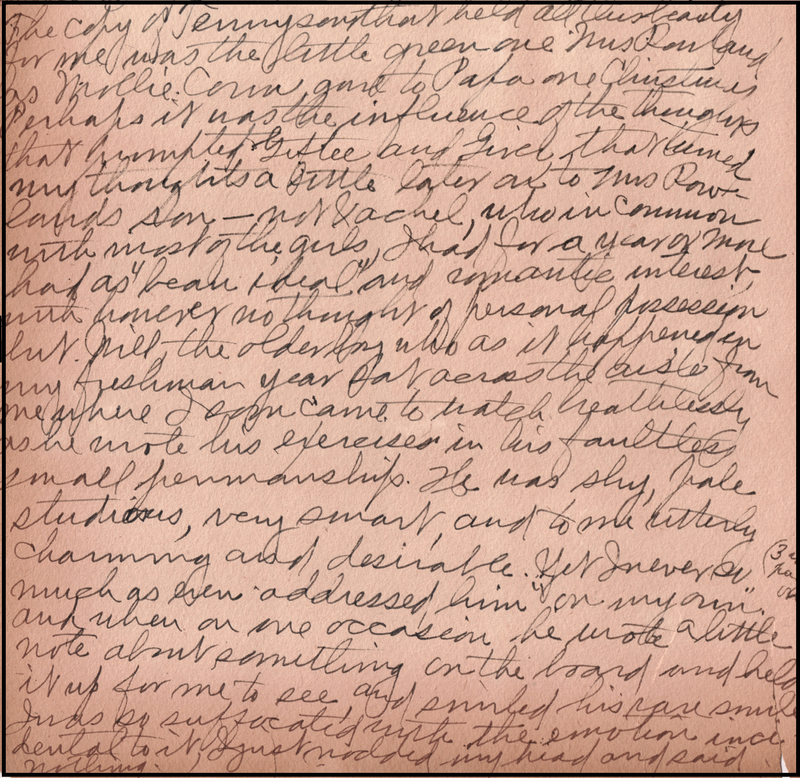 His letters were often brief, but they told of his daily activities and asked about hers. Unfailingly, he signed with "all my love" or "your devoted husband" or other endearments. He participated in a number of civic groups and literary societies; he attended concerts and plays. All in all, I surmise that Robert was a learned and sophisticated yet friendly man who was loved and respected at work, at church, at home, and about town. 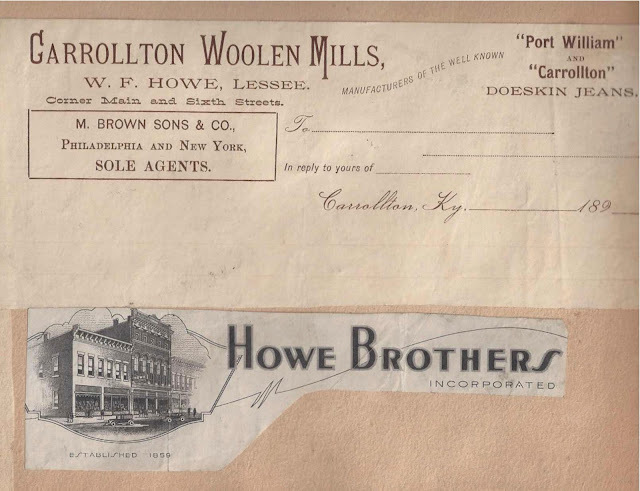 Today we focus on Howe Brothers, Inc., purveyors of household goods and fashionable clothing for men and women. In this fading image, circa 1910, Robert J. Howe stands with three women who could be store employees or Howe family members. 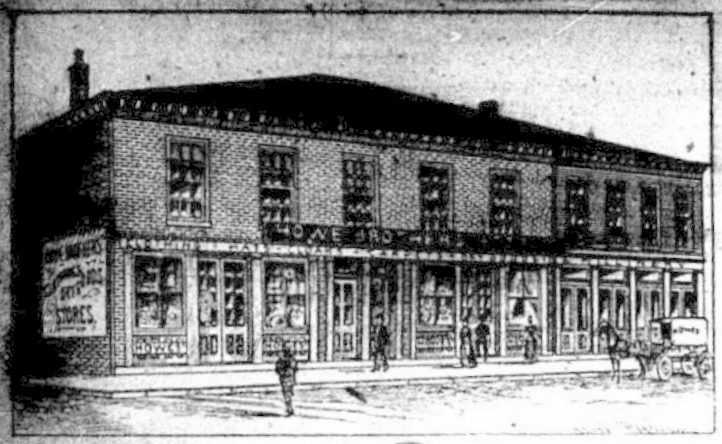 The immigrant John Howe launched the store, possibly in the late 1870s, and his sons had a hand in management of day-to-day operations. While first-born son William Ficklin Howe was more focused on the family's woolen mill and pants factory, his younger brothers John Irvin Howe, Robert James Howe (father of Sarah, the scrapbooker), and Joseph Brown Howe were running the store. The youngest son, George Thompson Howe, apparently had a role at the store, too, before he died in 18811 at 21 years of age. We have had a fine trade at the store all the week. Were very busy yesterday. Apparently, Robert and Joseph shared responsibility as buyers, traveling to wholesalers to select the goods that would be sold at the store. 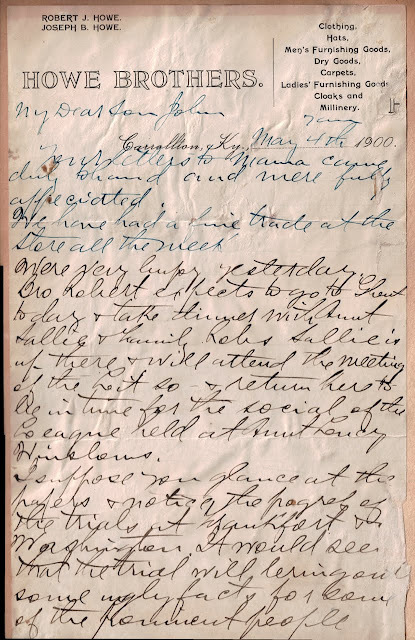 Clippings, letters, and Sarah's notes frequently mention her father's trips to markets in New York and other cities. One example is a society column from a Carrollton newspaper. 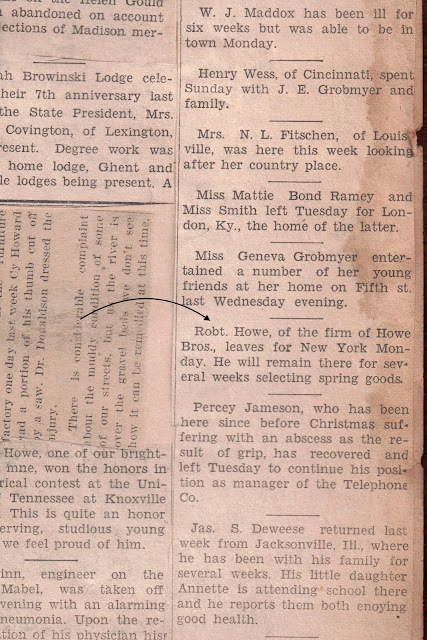 Her father's name is indicated in the clipping by an arrow. Joseph, who died on Dec. 7, 1929,2 said in the interview: "There were five boys in that store, and I'm the only one left." Joseph was in the middle of the birth order among the seven Howe siblings to reach adulthood. He outlived all four of his brothers and one of his sisters. His sister Sarah Varena "Sallie" Howe died in 1950 at 87 years of age. Robert and Joseph also wrote the Howe Brothers ads published in the Carrollton Democrat and possibly in other papers in the northern Kentucky and southern Ohio area. 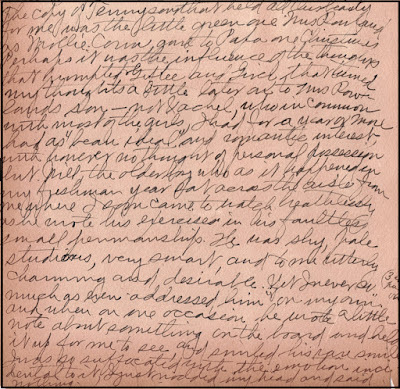 Sarah called her father's writing style "refined" and "sophisticated." She preferred it over the "flamboyant" ads written by her Uncle Joe. The two ads illustrate Sarah's point. Sarah proudly noted on one ad: "Papa wrote this one." 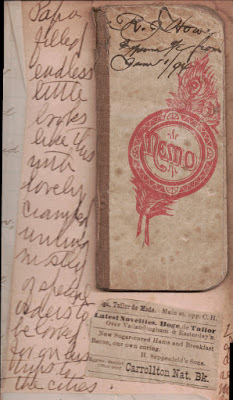 Elsewhere on the page, she wrote, "One of Papa's advertisements, nothing sensational, just dignified statement." The other ad was the work of Sarah's Uncle Joe, who perhaps was the more outgoing of the two and more prone to a "hard sell" approach. In 1893, when Sarah was 10 years old, she tried her own hand at writing ads for Howe Brothers, taking liberties with popular nursery rhymes. She commented that she knew they weren't as good as her father's, and she expressed little hope they would be published. In 1847, John Howe, Sarah "Sallie" Brown Howe, and their infant son William Ficklin Howe moved from Ireland to New York and soon, according to scrapbook notes and various records noting the birthplaces of three of his children, continued on to Fleming County, Kentucky. John used his skills as a tailor to support his family. 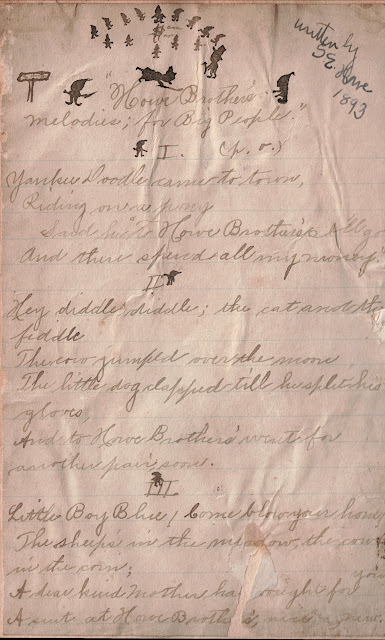 By 1857, John decided that farming would be a better way to support his expanding brood. He moved his household to a patch of prairie near Urbana, Illinois, only to discover that he was not cut out for farming1. The family left Urbana for St. Louis, Illinois, then Madison, Indiana. By 1859, now with five children, John and Sarah moved to Carrollton, Kentucky. Carrollton must have been the perfect place for John Howe's entrepreneurial spirit to thrive. Returning to skills he learned in Ireland, he set to work as a merchant tailor2. Later, for a few years, he tried his hand at banking by establishing John and W.F. Howe and Sons.3 He also established (or bough?) 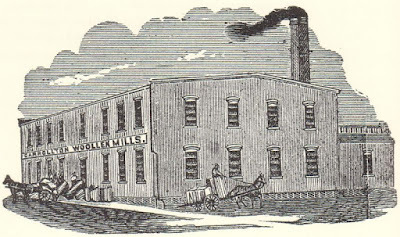 Carrollton Woolen Mills and then launched a related business, Carrollton Pants Factory. He made fabric, then clothing, so the logical next step was to open a dry goods store that sold those goods not only to wholesalers and distributors but directly to consumers. The store flourished and, over time, expanded to add styles from big-city fashion houses. Among the several valuable manufacturing institutions in Carrollton is the pantaloon factory recently established in connection with the Carrollton Woolen Mills. It is located in the building known as the old woolen mill on 6th Street. We called the other day to inspect some alterations that were being [done] with a view to increased convenience and greater capacity, and were highly delighted with the scene. Nearly everything is done by machinery, the operatives being for the most part bright, handsome ... young women — and how they do hustle! However, the work is not heavy, as all the machines are run by steam. There are 13 splendid sewing machines, a button hole machine, a button machine and a crimping machine, each in the charge of a young lady, Miss Ollie Craig being the efficient forewoman in this department. The ladies at present employed are: Misses Ollie Craig, Zella Scandrett, Lucy Betem, Nannie Welch, Linda McKim, Laura Coghill, Minnie Meier, Virginia Soar, Barbara Lang, Lulie Leap, Nannie Soar, Mattie Welch, Rosa Lorch, Katie Betem, Hattie Brown, Eva Porter, Mary Dugan, Ella Hays, and Annie Morgan. ... Several other persons fill positions about the factory — two young Kendall brothers doing all the pressing while Edgar Williams and perhaps others are 'general' men. The total number of employees is 25. Many of these would be earning little or nothing if it were not for the opportunity the factory gives to them, and hence we started out by calling it a very valuable institution. ... At this time the weekly payroll of the two concerns amounts to nearly $500 — and a fourth of the machinery in the mill, perhaps, is not running. Mr. Howe feels very much encouraged from the success of the new enterprise. 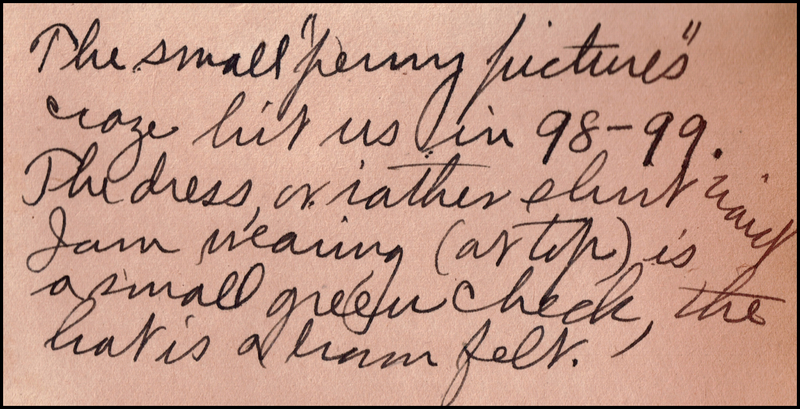 He said: “A gentleman was here from Louisville today and gave us an order for 76 dozen pairs; Mr. J.B. Ribella, who travels exclusively for this factory and the woolen mill, is sending in some orders. Besides Mr. Ribella, we have five men who are on the road who sell for both departments on commission. The latter, however, represent us in connection with other lines." 3 History of Kentucky, Volume 5 by William Elsey Connelley, Ellis Merton Coulter; American Historical Society, 1922; p. 238. See online at http://tinyurl.com/CarrolltonHistory-Howe. 4 Image from http://www.nkyviews.com and included here with permission. 5 Excerpt posted at http://www.nkyviews.com/carroll/carroll_businesses.htm; included here with permission. 6 Full article posted at http://www.nkyviews.com/carroll/text/pants_factory.html; included here with permission. 7 Image from http://www.nkyviews.com/carroll/carroll_businesses.htm; included here with permission.